Ten years ago, if you asked UM Senior David Detrick what he would be doing today, he might have still pictured himself writing, but with his words grounded in music rather than in the news. He played with bands in Los Angeles, California before moving back home to Seattle, Washington. Detrick founded his own band in Seattle called Saving Arcadia, and he wrote all of the lyrics to the Green Day and NOFX style songs. 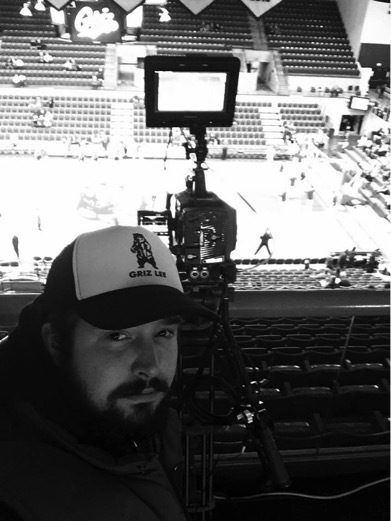 Detrick sports a Griz Lee hat and gets ready for a Griz basketball game on December 22nd, 2015, as part of Griz Vision. With his newfound passion for journalism, Detrick had his eyes set on the School of Journalism at the University of Montana. His acceptance to the program also came with a Western Undergraduate Exchange Scholarship, based on his academic success at SPSCC. The outdoor photography and sports journalism opportunities, ever popular in Montana media, aligned perfectly with Detrick’s interests. On February 11th, 2015, the Montana Kaimin published a feature-length piece that he wrote about a UM alumni football player who got signed to the Seattle Seahawks. This past year Detrick photographed Griz football games and also filmed Griz and Lady Griz basketball games as part of a program called Griz Vision, which gives students professional experience with broadcasting sports live. Outside of academics, Detrick started his own business in 2015 called Griz Lee, which he called “a Montana inspired clothing line with an attitude for anyone with a sense of humor to enjoy.” Around campus, most students are familiar with the Griz Lee logo, featuring Bruce Lee’s head on top of the body of a grizzly bear doing Kung Fu. Detrick gets a real sense of pride when he sees Griz Lee stickers slapped onto water bottles or laptops. Yet he was determined to follow through this time around. Detrick pitched his product to the University Center Bookstore, and now says Griz Lee items sell out faster than they get re-ordered. Detrick has also spread his business around Missoula, thanks to social media platforms like Instagram and Facebook, as well as word-of-mouth. Now he’s answering orders from people as far away as Tennessee, which he suspects has to do with the Memphis Grizzlies, a professional basketball team. In April 2015, Detrick won the Dean’s Award for his outstanding performance in Journalism. As a senior this year, he’s only been taking Journalism classes, and he knows that more doors open as he continues to gain experience—not just for him, but also his nearly four-year-old son. “The sky’s the limit now,” Detrick said.